Set the mood by finding a space in the house where you will enjoy an uninterrupted hour. Add your favorite things to the room like candles, soft music, glass of water w/Lemon, etc..). If your space is the bathroom, make sure to have your soft towels and wash cloth ready. If you will be taking a bath, fill the bath with nice warm water and your favorite bath salts. Bring everything into your special room on a tray for ease of use (and cleanup). Include your fresh ingredients, a paring knife to open the fruit, a spoon to remove the pulp, a fork to mash the fruit and for stirring, 3 small dishes (two for the final formulas and one to separate the egg white into), a small strainer, a measuring cup, and a teaspoon. Three important additions for making a well rounded spa treatment will be an all-natural cleanser and moisturizer, and a hydrosol. Fill the measuring cup with a 1/2 cup of warm tap water, or other type of warmed water. Add your 2 tablespoons of Oats to begin the making of your SharAmbrosia Avocado Masque. Set aside to let it soak for 20-30 minutes. If you're taking a bath, this would be the time get in and cleanse your face. Massage the cleanser on face, neck, chest, shoulders, arms and lower legs and feet. Soak a washcloth in the warm water and gently remove cleanser. Stand, and repeat above two steps on the rest of the body. Follow the directions for the SharAmbrosia Mango Scrub (below). This is great for face, body or both. A nice gentle hydrosol such as Lavender or Chamomile would feel and smell great at this point. Apply some to a cotton ball and massage the skin with it to remove any excess Scrub. 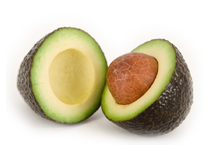 Finish making your SharAmbrosia Avocado Masque, and massage it into the skin. Continue massaging and reapplying for 10-20 minutes. 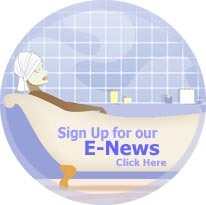 Either drain the bath at this point while you stand and it treats the entire body, or use the masque just on the face, neck, chest, etc.. while you remain lounging in the tub. When it's time to remove the masque, use a warm washcloth to gently remove the excess. This would be a great time to enjoy a shower to wash hair and make sure you're clean all over. Then finish with a cool rinse. This step takes some getting used to. Start with the hair and scalp, then the face, and if you're so bold, next the body. This final step of your shower really tightens the pores and makes you feel refreshed. If you feel that you need a moisturizer, this is when you'll want to apply it gently into the skin. And whether you use a moisturizer or not, a lovely spritz of your hydrosol before and after will feel so yummy. Enjoy! Mash the Mango very well with a fork. Stir in the Honey, then add the Almond meal. You should have a workable paste that you can spread and massage on a freshly cleansed skin. Be especially gentle on the face. 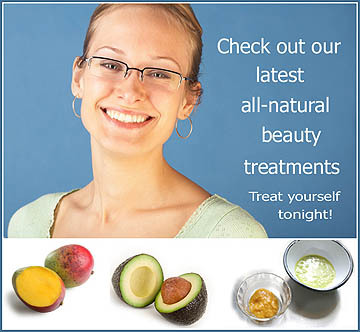 You'll receive the enzymatic action of the Mango as well as the manual exfoliation of the Almond Meal. So this is a powerful exfoliation treatment. The Honey acts as a mild buffer and humectant. After massaging for 5-10 minutes, gently remove with a warm washcloth. This is the perfect 'before' treatment to the SharAmbrosia Avocado Masque. Otherwise, apply your moisturizer. Add 1/2 cup hot water (not boiling) to measuring cup. Add Oats and let them sit in the water for 20-30 minutes (this is a good time to cleanse your skin and give yourself an exfoliating treatment). After the Oats have softened, mash the Avocado very well with a fork. Stir and press the Oats in the measuring cup, then strain two teaspoons of the Oat water into the mashed Avocado. Stir them together. Separate an Egg, and add just the yolk to the mixture. Stir well. Apply this mixture to either your face, or face and body for a nourishing and softening mask treatment. Don't let it dry completely, just keep applying and massaging for about 10-20 minutes. Gently remove with a warm wash cloth, then add your favorite all-natural moisturizer. This is the perfect 'after' treatment to the SharAmbrosia Mango Scrub. Otherwise, use on a freshly cleansed skin.